This isn't a new topic. I've heard many people before talk about how this phrase is so detrimental. I want to propose a different take on it, instead of the classic negative view. There's a running joke at my office about this phrase. In a sprint retrospective, as a relatively new member of the team I mentioned that I was sick of people answering my questions with "We've always done it that way". As a result, my coworkers now like to toss the phrase out at me in playful office jest. But all jesting aside, it did spark some very interesting discussion. I realized that I wasn't tired of hearing that phrase specifically, but I was tired of hearing it used as a way to explain away a questionable practice without any responsibility or ownership. As the newbie on the team and getting frustrated with the painfulness of process X, when I asked "why do we perform action X this way? ", it was easy for a more experienced team member to reply with "we've always done it that way". This avoids having to explain the "why" portion of my question and halts all discussion about improvement. I don't think anyone's doing in intentionally, and that is what makes the phrase so detrimental. A year ago, I was listening to a talk by Adam Goucher (@adamgoucher) entitled "It's our job to collect stories" (Title may not be exact). One of his points was regarding this phrase. Adam pointed out that if "we've always done it that way", then at some point a decision was made to do it that way, and that decision must have been based on certain factors at the time. Make sense? Furthermore, if we trust our team, then we should also trust that it was the RIGHT decision at the time. So perhaps the phrase is actually an indicator of a previous decision that needs to be reassessed. We should be able to justify WHY a particular choice was made. I believe this blanket statement is so popular because it allows us to skip the justification altogether, thus not requiring us to think about the reasons behind the initial choice. I liken it to the classic scenario of a child asking an adult "why" repeatedly. Once we run out of the ability to provide a reasonable explanation, we revert to "because". But children often don't accept "because" as a response. They continue to prod. Child: Why do we wait until 8:00pm to eat dinner every day? Father: Because that's the time our family has always eaten dinner. It's easy to imagine that the father thinks this answer should suffice for the child. But what if the child is getting hungry at 6pm every day? This answer would probably frustrate him. Here's the magic part that transforms this phrase from detrimental to something that can be used to focus improvement. Child: Well, why so late? Father: Because my dad didn't used to get home from work until after 7pm. Child: But you get home from work at 5pm, and I'm usually hungry by 6pm. Father: You're right - I never thought about that before. Let's make it 6pm then. It's a silly example, but it shows the point clear enough. By pushing to get to the reason why the family eats so late, they were able to recognize that they could change dinner time with no negative effects, while improving the scenario for the kid (he's not starving for hours each evening). By pushing back and refusing to accept a blanket justification, we can dig down to the underlying reasons a decision was made. Perhaps a decision was made 2 years ago based on a time crunch, but now we have time to address tech debt and this particular feature would be a prime candidate. In fact, any time the question "why do we do X?" gets asked, it should be a flag to investigate further. You may find there's a reason that is still valid, in which case, no harm to have asked. But I'm guessing that fairly often you will find a decision was reached based on factors that have now changed. Sometimes it just takes that one stubborn person to point it out. So the next time you're asking "why" and you get that dreaded response: push back. Encourage everyone involved to dig deeper, and find out the real reasons. It has worked for us and begun to help foster discussions of iteration and improvement on things we've been doing for a long time. 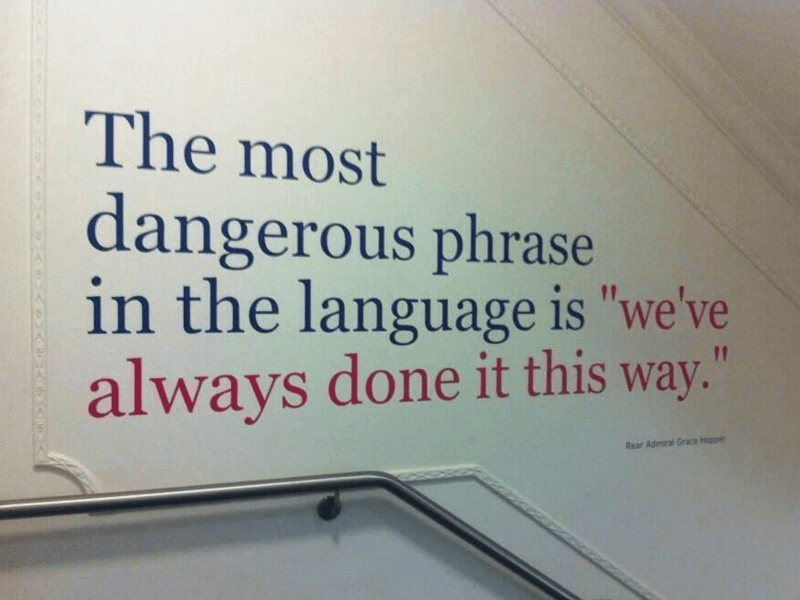 Just because it has always been done that way doesn't prove that it's the best way anymore.